The ruble’s rollercoaster path may be finally heading toward stability, according to the International Monetary Fund head of mission Bikas Joshi. 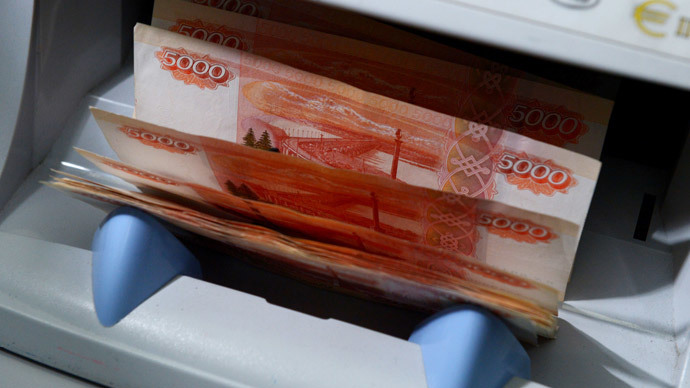 The analyst applauds the government actions taken to quell the ruble’s sharp volatility. After closing 2014 as the world’s second worst performing currency, the ruble is back on track, thanks to the government, Joshi told TASS in an interview Friday. The ruble hit rock bottom against the dollar on December 16, when it lost more than 20 percent, with one dollar buying 80 rubles. After serious bank interventions and other measures, it has recovered to about 65 to the dollar. After the crash, the Russian government ordered five major state-owned exporters, including Gazprom and Rosneft, to sell part of their foreign currency earnings to support the ruble, which added about $1 billion to the daily ruble market. "It seems that the period of sharp ups and downs is coming to an end. The measures that were taken are beginning to work, that is the increase in the key rate, and support for the banking system, and the provision of foreign currency, and liquidity to market participants. All of this is supporting the ruble, and will probably be maintaining it in the future,” the IMF Resident Representative Office in Russian Federation said, as quoted by TASS. Overall in 2014 the ruble lost 46 percent against the dollar, on par with the 50 percent fall in oil prices. "No one knows where the oil prices will go. We do not expect the prices to go down in the near future — we are looking at the futures and see that they suggest a slight increase. Of course, not to the prices that we saw before, but it will still be an increase," Joshi said. As of December 26, the Central Bank of Russia reported it has $385.5 billion in foreign currency reserves, after an 8 percent decrease during the month. Russian Prime Minister Dmitry Medvedev also spurred optimism for the currency after he pledged support for the sliding currency at this week’s Gaidar Forum. Like President Putin, he supports the actions of the Central Bank, particularly the decision to keep the ruble free floating. At the forum, comments from German Gref, the CEO of Russia’s largest bank Sberbank, suggested that the Russia government may take more assertive steps in supporting bank reserves. Gref said that as long as oil remains at $45 per barrel, the banks would need $50 billion (3 trillion rubles). In December, the government submitted a bill to the Duma that would pump 1 trillion rubles into banks.